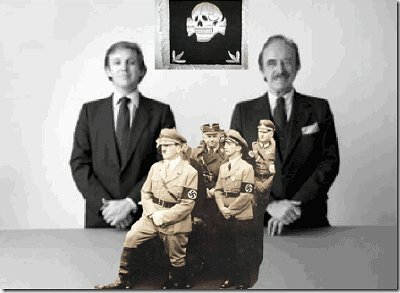 Donald and his father Fred with Masonic/Brotherhood of Death hand-over-hand Skull and Bones (“X”) Signal. The sign, or letter X, has a long history of use in the Ancient Mystery Religions, in apostate Judaism, in Freemasonry, and in the Occult. The ILLUMINATI elite use it to this day to symbolize key phenomena and mark significant events. 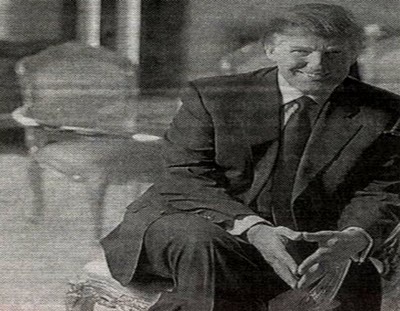 Trump makes the Masonic descendent triangle sign in this early photo. 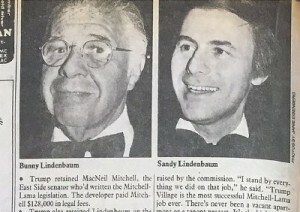 Donald’s father Fred moved in the circle of a corrupt powerful New York political fixer and power broker attorney, Abraham (Bunny) Lindenbaum. Or Bunny moved in Fred C. Drumpf’s circles. They were more than just client and attorney. The two were joined at the hip. Bunny’s first retainer came from Fred C.
Fred and Bunny were political insiders of [Masonic] Tammany Hall through Brooklyn’s Madison Club. Tammany Hall, also known as the Society of St. Tammany, the Sons of St. Tammany, or the Columbian Order, was a New York City Democratic political machine entangled and mired in racketeering, corruption, graft and patronage.